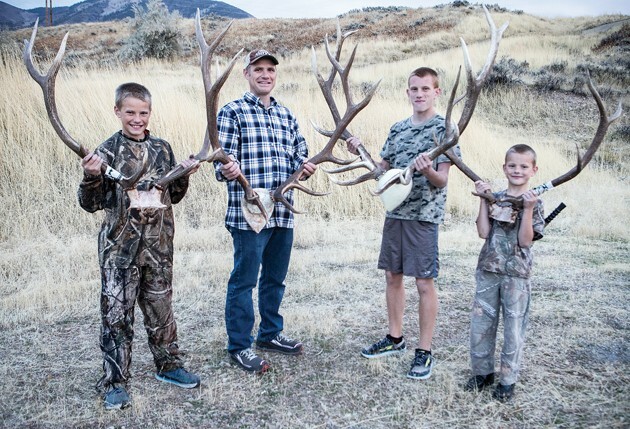 John Simper and his three sons Joseph, Jacob and Isaac hold mounted elk horns. The family often hunts together bringing down game such as elk and mountain goat. 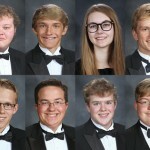 They all enjoy competing at elk-calling competitions. Joseph Simper started to learn elk-calling when he was only 6. Jaob Simper has successfully called in a herd of elk. Jacob, Joseph John and Isaac Simper hold trophies they have won at elk-calling competitions. In the Best of the West competition held in Las Vegas in 2015, Isaac Simper placed first in the peewee division and won $500. At the RMEF youth division held at the South Towne Sports Expo in Sandy, Jacob Simper won first and Joseph placed second. John Simper holds elk antlers. Simper has been captivated by elk for decades, he started hunting big game when he was 14 with his father. Calling a bull elk in the wild produces an adrenaline rush that surpasses winning a $3,000 first-place prize for being the Best in the West at elk calls. But even better is watching your sons excel in their elk-call-divisions, Tooele’s John Simper said. In 2014, as a novice elk caller, Simper sought out a professional to assess his calls to learn whether or not he should compete. Simper was told by nationally renowned caller Cory Jacobson that his call was better than 90 percent of the callers Jacobson had heard at the Intermountain Man’s Sports Expo competitions. As a result, Jacobson urged Simper to begin competing. From that point on, Simper’s interest in elk calling jumped from hobby to competitive sport. After meeting Jacobson, Simper said he didn’t expect to do well in competitions. 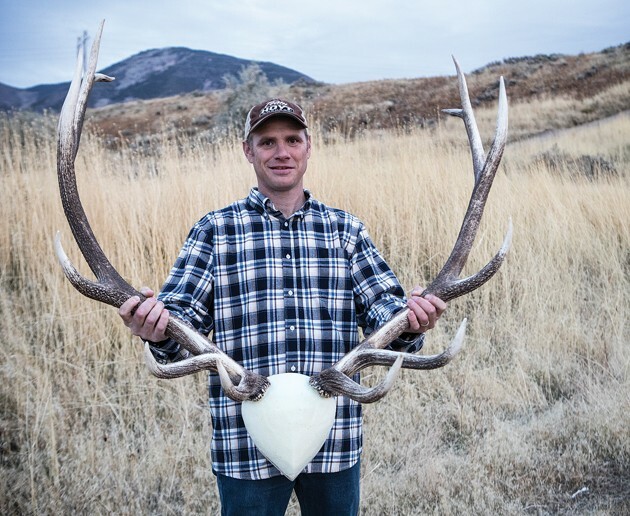 But in March 2015, he won the men’s division in the Best of the West competition in Salt Lake City, earning over $3,000 worth of prizes, with a top of the line bow from Hoyt and $500. Simper said he hadn’t expected such high praise by the national champion when he solicited Jacobson’s opinion three years ago. He added that Jacobson’s “90 percent” assessment was in comparison to callers Jacobson had heard at the Rocky Mountain Elk Foundation competition. As a result, Jacobson urged Simper to enter the RMEF contest. Attending seminars, being outdoors and competing are the other strategies Simper has used to better his calls. He said he had so many questions that he frequently attended seminars at the Sports Expo and other hunting enthusiast gatherings. Being outdoors among elk, where he could hear their sounds first-hand, also increased his skills. As for competitions, Simper said that he learns from other competitors and gains insight by listening to how they work a call or elk sound. “If we compete, it’ll only make us better,” he said. Simper was captivated by elk decades before he began calling competitively. He started hunting big game with his father when he was 14. Soon after, he found he liked elk hunting more than hunting deer. When he was around 21, after returning from an LDS mission, he further fine-tuned his hunting chops as he began archery hunting with a friend. As his elk hunting progressed, so did his elk calls. Eventually, he became a father and included his own sons on hunts. 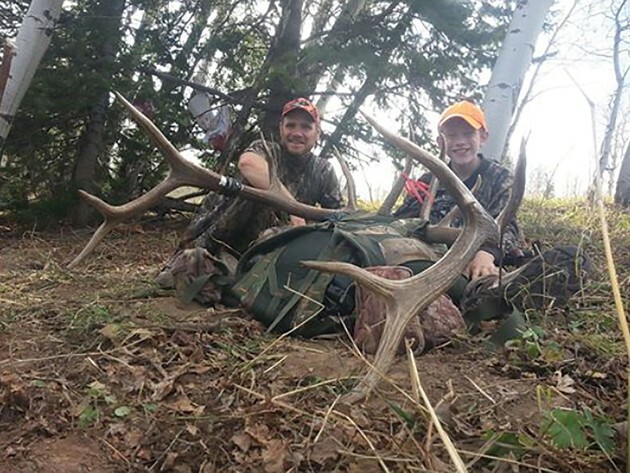 Simper’s boys, Jacob, 14, and Joseph, 11, started with their father in March 2015 and began to excel, getting into children or youth division competitions. Simper said he often takes all of his children (three boys and two girls) with him on hunts. When they express a desire to learn, he teaches them the best he can. Joseph wanted to try elk calling when he was only 6, Simper said. The boys participated in the RMEF youth division last March at the South Towne Sports Expo Center. Jacob won first, and Joseph placed second. Jacob won $500 and both boys won merchandise, which included compound bows, rifles and hunting gear, along with trophies. Before that, Joseph won $500 for placing first in the peewee division in December 2015 in Las Vegas for the Best of the West competition. Typically, the divisions are divided into peewee, for children 10 and younger; youth, for 12-17; voice, which is group calling. For those over 18 there are three categories: amateur, women and professional. Simper said he enjoys elk calling, but it’s more enjoyable for him to watch his boys participate. “I get more excited to watch my boys,” he said. There are a variety of reasons why people compete in elk-calling competitions. For Joseph Simper, the prizes are the motivator. “I just want free stuff,” he said, earning laughs from his brother and father. Simper explained that some people make a living competing. 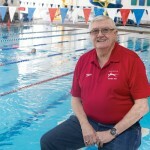 But he said that he and his sons mostly call to get better at their sport. However, Simper and his boys are competitive and they don’t compete without preparing. They are always practicing, but they step up their efforts about two to three months before competitions and the hunting season. Simper said they practice in their home, in the mountains and when they’re hunting, working to get the elk to respond to them. While hunting “you pretty much use it all the time,” Jacob Simper said. 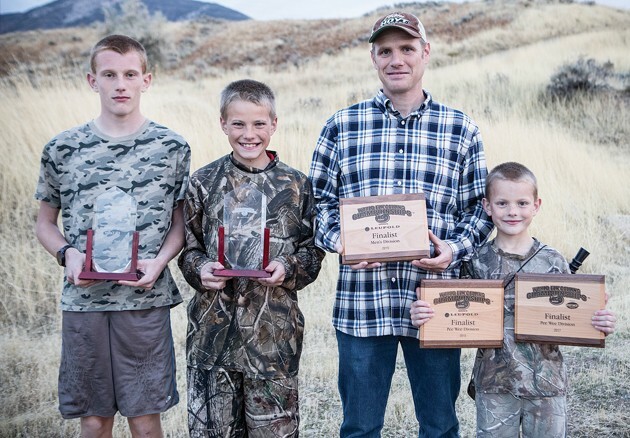 Simper makes it a priority to help his sons develop their calls. They all walk about their house practicing, he said. 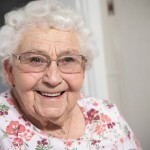 The Simper’s neighbors often will see and hear them practicing their calls when they are outside. The herd bull is the largest of the elk herd. Simper sees elk as the king or ruler in the mountains. The herd bull, or male, runs the herd and oversees all the cows, or female elk, he can gather. “You get a huge adrenaline rush having them come rushing at you while your son takes aim,” he said. According to Simper, studying elk is the best way to begin elk calling. Going outside and listening to the animal after the season is over, and practicing with them, is one of the most beneficial ways to learn firsthand the sounds and nuances of elk calling. “[You] just have to think like elk do — and keep trying,” Simper said. Simper said those who are interested in elk calling can visit the Rocky Mountain Elk Foundation website, at www.rmef.org, to find competition dates and register for competitions. In March, he said, the foundation will host a competition in Salt Lake City, with a grand prize purse of $10,000. 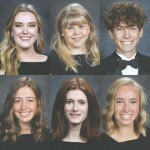 While the Simpers have competed in the Salt Lake City contests, they have also traveled to Las Vegas for the Best of the West competition. The two competitions’ formats are different, he said. With Best of the West, everyone competes against everyone — there are no age divisions or specific groups. So, average people face off against professionals. Simper said the format is fair since the judges never know the competitors’ identities. The contestants call from behind a curtain and the judges only know the caller by their number and the call the contestant made. Types of calls include a cow or a bull call, bugle, mew, chirp and bark. The judges throw out each contestant’s highest and lowest scores, then average up the remaining scores to determine the winners. Simper and his sons haven’t earned top places every year, but they said they don’t mind that result. Last year, Simper said he drew first caller and had confused his reeds. As a result, he didn’t place, but he used the contest feedback to better his elk calls. For Simper, calling elk is almost spiritual. 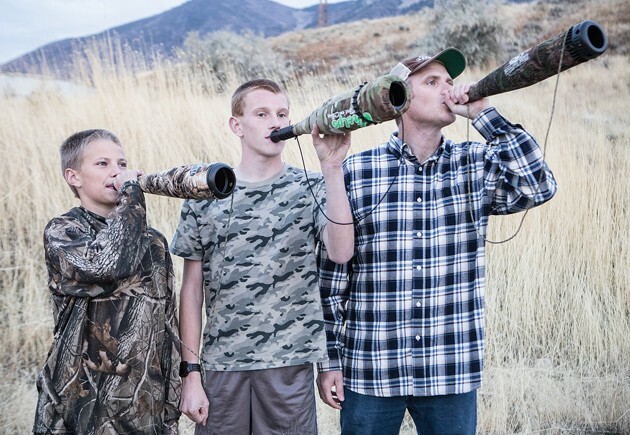 While Simper and his sons enjoy elk calling, and seeing the animals in their natural habitat, the best part for them is enjoying it together as a family.